The Triumph of a Hero is composed in the style of the traditional classics on non-duality, in verse, by one who knew the Supreme reality as Self. It was written in 205 verses of rhythmic, rhyming Sanskrit with extreme precision and profundity. Here it has been translated as far as possible into English, by Hari Prasad Shastri. The author, Swami Manjalnath, lived as a renunciate in the Himalayan foothills, where the translator attended his Sat Sangs and personally served with him. Since nothing at all other than Atman has any real existence, Creation cannot be for the sake of another. And since Atman can have no purposes of His own to fulfil, the wise call the Creation “the mere sport of Atman”. It is impossible to enumerate or estimate the present Creation, or the future or past ones. We can only call Creation His sport. And at a certain time that Atman hears in a right way the statements about Atman and, freeing Himself from the influence of avidya and its effect the world, induces in Himself the Turiya state which is above both manifestation and non-manifestation. And the world-revered Acharya, Shri Shankara, has set out with certainty in his great commentary the subtle meaning of the Sutras of Shri Vyasa, and has shown the real meaning of Vedanta. The holy Shankaracharya was not an innovator of the Vedanta system but followed in the wake of the Acharyas before him, who also described the nature of Brahman as Existence, Consciousness, Non-duality and Bliss, and as identified with Atman. It is never reasonable to attribute reality to what is non-existent or non-existence to what is real, since what is unreal is ever non-existent whereas clear and strong reasoning establishes that what is real is ever existent. Whatever is non-existent is ever non-existent, and whatever is existent is ever existent. This principle, which can never be contradicted, is the basic principle of Vedanta. As an earthen pot is assuredly nothing but earth, so is the body, in fact, pure Consciousness Itself. The division into Self and not-Self is spoken of by way of instruction. 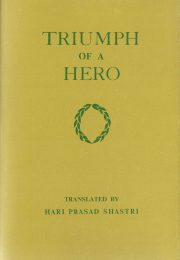 For some students of non-duality with a philosophical turn of mind, Triumph of a Hero would be a helpful book to read carefully during dedicated study-time.